I wore Revlon Espresso for a wedding, but wanted to add something simple on top to make it a little cuter. 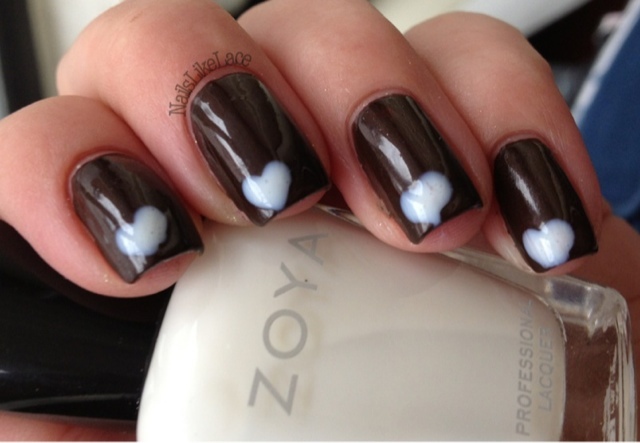 What better type of nail art for a wedding than hearts?! So I grabbed Zoya Adel and added small hearts to the corner of each nail. Now, I am not trying to sound conceded, but it is always nice to hear from strangers that your hard work looks good. "Did you do that yourself? No way!" "Do you do other people's nails, too?!" "Oh those are so cute! Here, show (insert other worker girl's name here)!" Honestly, my thought, after "Aww thank you! I love doing nails! ", was but wait... that's not even a complicated design, you should see some of the other stuff I've done if you think that's impressive! 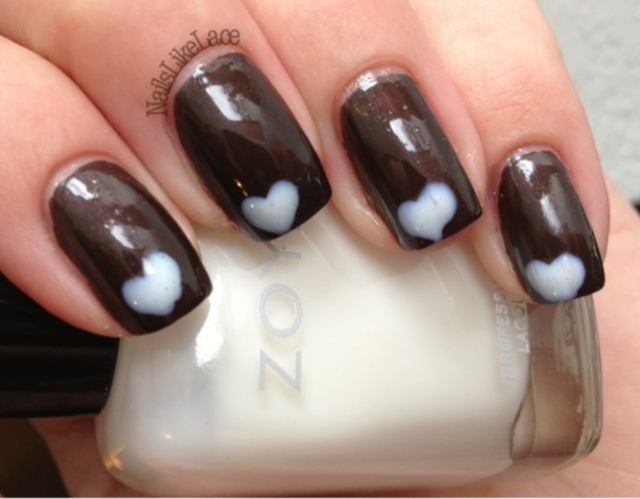 I guess being part of the nail art community, some simple, cute hearts are pretty much nothing to me anymore. I'm used to seeing extravagant, crazy designs that take two hours on a regular basis! Apparently the rest of the world isn't on board with us! Ha!